How do you find out provider cesarean delivery rates? We have a new resource we want to share with you below. We are excited about this resource because in our experience we have found resources are limited for comparing provider rates. During the first week of Pain to Power Online Childbirth Classes and Videos (Pregnancy: Full of Life) we encourage participants to research their providers by asking, “How do you know you’re getting good care?” and offer resources, but in the future we hope to offer even more comprehensive resources. Let’s look at what is available to pregnant women regarding their provider cesarean rates. For a subscription fee, one can check Consumer Reports and one can also check the CDC as well as one’s home state Department of Health, but without a PhD it takes some time to find and compare the numbers. Since cesarean rates vary so greatly – at a low with the World Health Organization recommending no more than a 10-15%, to states in the U.S. such as New Jersey and Louisiana, reaching the mid 30% range, it is important to know your provider’s rate. We are often put in the position of asking our providers directly using such prompts as found in Choices in Childbirth’s Questions to Ask Your Care Provider. Their blog, “The story behind C-sections in America: A state-by-state analysis and a new C-section predictor for pregnant women” provides an interactive map that shares some “statistics related to C- sections along with a predictor tool that reveals C-section rates by doctor.” To find provider rates, start at the homepage and proceed from there. Check it out and let us know what you think. Will you be using Amino? What resources do you currently suggest to clients who want to know more about their provider rates? We hope to discuss with you and other readers, so please leave your comments below, for birthkeepers and expectant mothers to see. “What happened to your hands?” This was the question that was asked to us many times as we strolled through Ubud market on a warm sunny afternoon in Bali. We were greeted with many smiles in the shops we entered, that quickly turned quizzical as they looked down at our yellow stained hands. “Tumeric” was our constant reply, and with that came some realization, but still lots of questions in their eyes. 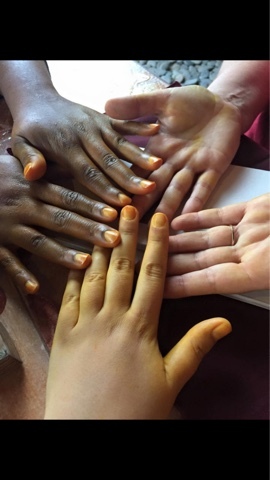 Why would tourists hands be stained with tumeric? “You do cooking class?” Was usually the follow up question, as their curiosity peaked. Having long given up on explaining that we were doulas early into our stay in Bali, we replied “yes, Bidan”. Our yellow hands were no longer met with caution after the people we came across knew we were “bidans”. You see here in Indonesia a midwife wasn’t just a midwife. After attending the birth of a family’s child, it wasn’t unusual to be then invited to every special or sacred life event of that family. From attending a marriage, to welcoming a new life, and even the passing of one. The midwife played many roles; and when one was sick, a midwife could even be found at the foot of that bed to offer healing. My yellow hands stained everything I touched. My phone is now turquoise and yellow, my white wallet permanently marked and even some clothes that may never be the same, but I regret not a single moment. A hot afternoon of birthkeepers gathered in a kitchen making jamu and talking about birth, gave me the hands of a Bidan. The hands of a healer. Jordan Christopher is a birth & postpartum doula, childbirth educator and founder of Maternal Beginnings Doula Services in New York City.Her belief is that every woman deserves a safe and empowering birth experience, and therefore uses her various talents, combined with a wealth of compassion, to support women and their families before, during, and after their birth. Join us for Eat Pray Doula in 2016! Learn more ways to bring gentle birth to your clients and join a circle of loving, passionate women for this incredible retreat. Please help us raise $1,000,000 for Bumi Sehat! Visit our Crowdrise Campaign to learn more.